Understanding the nature of Dark Energy, the engine driving the accelerated expansion of the Universe, is one of the great challenges of modern science. One of the ways we can understand Dark Energy is by studying the expansion history of the cosmos. And we can understand the expansion history of the cosmos by studying Baryon Acoustic Oscillations (BAOs). BAOs are acoustic patterns in the large-scale distribution of neutral hydrogen. Density variations present at the beginning of the Universe produced sound waves in the plasma filling all of space. These waves stopped travelling when baryons decoupled from radiation and the Universe became transparent. This left the Universe filled with BAOs: spherical shells of excess density whose size is approximately 450 million light years today. BAOs serve as “standard rulers.” Because we know the absolute size of BAOs, their apparent size in the sky tells us their distance—just as the apparent size of a metre-long stick tells us its distance. Together, their distance and redshift let us examine the expansion history of the Universe. The Canadian Hydrogen Intensity Mapping Experiment (CHIME) will measure the size and shape of BAOs as a function of redshift. It will do this by mapping the distribution of matter through the 21 cm radio emission of intergalactic hydrogen. Such Hydrogen Intensity (HI) mapping is faster than using galaxy surveys which rely on observing individual galaxies and are complicated by the physics of galaxy evolution. A map of large-scale structure in the Universe from the Sloan Digital Sky Survey and its Baryon Oscillation Spectroscopic Survey. 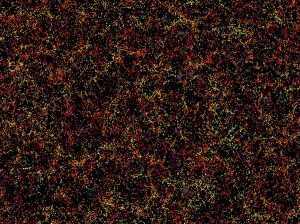 The image is six billion by 4.5 billion light-years, with each dot indicating a galaxy. Image: Daniel Eisenstein and SDSS-III.